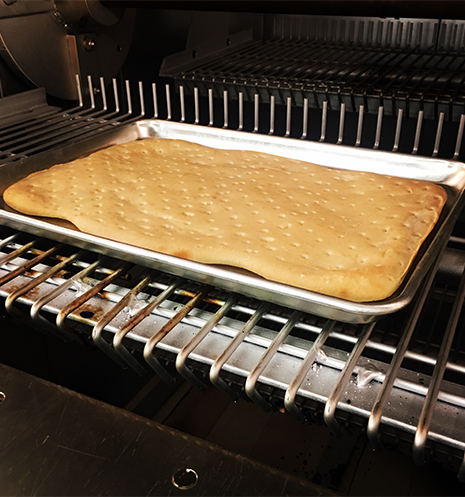 Mature and consistent categories such as flatbreads, pizza crusts, and crackers are undergoing exciting innovation in response to the push for products that are clean label, made with whole grains, unique, and nutritious. Adding whole grains or innovative ingredients to lean formulas like flatbreads and pizza crusts has the potential to negatively impact the product as it progresses down the processing line. Manildra’s GemPro Extend is available to not only act as a protein source but to provide both extensibility and strength to minimize such negative effects. The addition of inclusions or whole grains can disrupt the protein network of the dough, causing it to become difficult during production at either the moulder or sheeter, for example. GemPro Extend offers the protein boost to maintain the necessary dough structure but with the added benefit of extensibility. It will help to minimize tears during sheeting and retain product shape after baking. To learn more about the benefits and uses of GemPro Extend, contact info@manildrausa.com for more information including the full technical report produced by our applications team. Collaboration is key so let us help you find the solution you’re searching for.